You have the right to remain silent…forever! Restored and re-mastered from original vault materials, Maniac Cop will blow you away with an all-new high-def transfer and DTS surround sound! Bruce Campbell (Evil Dead Trilogy) and Tom Atkins (Lethal Weapon) star in this action-packed horror favorite. Innocent people are killed on the streets of New York by a uniformed police officer. A young cop, Jack Forrest (Bruce Campbell) finds himself marked as the chief suspect after his wife is killed. As Lieutenant Frank McCrae (Tom Atkins) investigates these mysterious killings, the death toll rises and he suspects mysterious police cover-ups. This “maniac” cop must be stopped, but it might not be so simple! He isn't an ordinary man. He seems inhuman and ready to take on the entire police force, hell-bent on revenge! 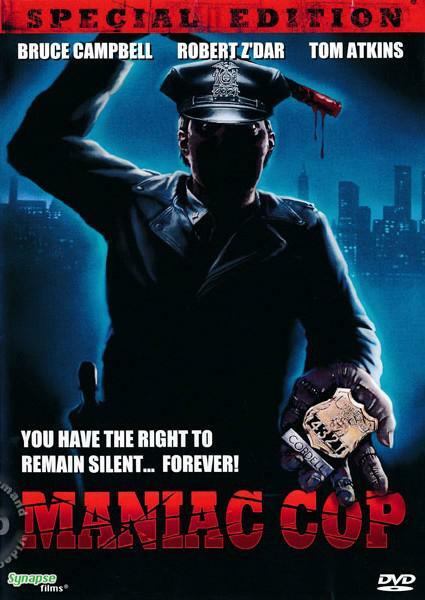 Long considered a classic of the genre, Maniac Cop was written and produced by Larry Cohen (Phone Booth, Cellular) and directed by William Lustig (Maniac, Vigilante).